The novel idea of Punjab Revenue Minister Bikram Singh Majithia to have counter audit of stamp fee payable on property registration has paid rich dividends as initial audit of over twelve Sub Registrar offices has discovered under recovery of whopping Rs. 211 crores.International audit agencies including KPMG and PWC private limited today presented their preliminary report of 12 Sub Registrar offices to Revenue Minister in a high level meeting and the Minister said that his hunch of under recovery worth crores has proved right and asked the agencies to complete the pending task at the earliest. The agencies informed the Minister that they have completed the task of post assessment for one year in relation to documents registered or referred to u/s 47A by Sub Registrar offices of Amritsar 1, Amritsar 2, Jalandhar 1, Jalandhar 2, Patiala, Kharar, Ludhiana East , Ludhiana West , Ludhiana Central , Dera Bassi , Maajri, and Mohali for a period starting from 1st April, 2012 to 31st March, 2013 for Sale and Transfer Deeds Only. The agencies representatives informed that in the process they have assessed a total 1,84, 185 deeds and found 51334 deficit cases and under recovery of more that Rs. 211 crores. Now, they have with the help of concerned revenue officials started reconciliation process and a letter was being sent to the concerned party giving it a right to make himself or authorized representative present at the designated office of the Department for the process. On the appointed day, the addressee of the Letter would be explained the amount and type of deficit and the rule under which the said deficit has been observed. He would also be explained the process of depositing the deficit revenue amount and getting the same endorsed for his personal records as well as the government record. In case the buyer agrees to pay the deficit amount, he would be asked to pay in 14 days. In case the buyer submits fresh supporting evidence of any kind to rebut the deficit, the Vasika would be reanalyzed and the buyer would be informed within 7 days if there is any residual deficit after considering the evidence submitted by him.Directing Revenue officers to ensure time bound recovery of under recovered amount of stamp duty and other charges, Mr. Majithia said that Financial Commissioner Revenue would fix the schedule of recovery and monitor it strictly. He said that while effecting recovery the department should focus on big fishes to achieve the target of recovery at the earliest. 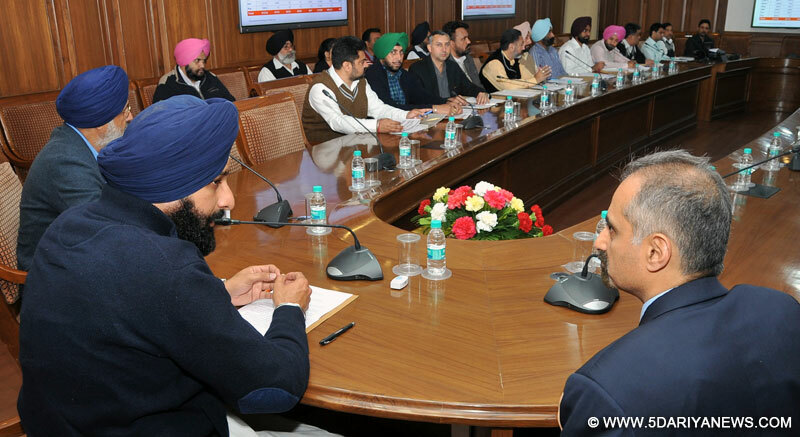 The meeting was attended by Mr. Arvinder Singh Bains, Special Secretary Revenue, concerned DROs and Tehsildars.